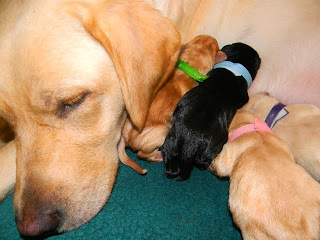 Susquehanna Service Dogs: An Important Question: Why Breed Service Dogs When You Could Rescue? It should be noted that a prominent service dog training organization that still accepts a small number of rescues (they primarily breed) gave the following statistics at a conference: for every 10 *preselected* (by the rescue/shelter) dogs that they assess, they find 1 acceptable candidate. For every 10 dogs they accept as candidates, 1 dog makes it. So they must screen 100 shelter dogs to find 10, of which 1 will be successful. This is not a sustainable plan. Similarly, Texas Hearing & Service Dogs (now Service Dogs, Inc.) looked at 4,945 dogs to select 17 candidates - I do not know how many ultimately graduated, but we're still talking about a tiny, tiny fraction of suitable dogs that can be pulled - and they were looking at both large and small dogs (for hearing work). The decision is not an easy one, but at some point it must be asked if a school exists to serve people or dogs. This is not to say the other half should ever be neglected - but if a school exists to serve its clients, the next question is how can the clients be best served. This may be at odds with how dogs can be best served (getting out of shelters), but specialization requires choices. Thanks for sharing those statistics, Cindi! There are dog owners who prefer purebreds, possibly because they're in love with a particular breed or are considering showing the dog or breeding it themselves. Knowing a dog's entire ancestry can be an added joy to ownership, and, in some cases, may even open the door to entering your dog into competitions. All responsible breeders do the things mentioned in this blog, whether they're breeding service dogs, for the show ring, for working dogs, or simply for companion animals. The general public still largely has no idea how to find responsible breeders, nor do they understand what they're getting in return for the (sometimes) higher price - a dog whose parents have been tested for genetic problems known within the breed, not just "vet checked"; whose temperament, size and physical characteristics will be largely predictable; who had the early stimulation described here to ensure the puppy will be able to tolerate stress and have a stable temperament; and who will always have a home with the breeder should the buyer ever become unable to care for the dog at any point in its life. The breeders I know all write that last part into their contracts. Some puppy buyers simply don't like being screened to ensure the puppy is good match for them - they get insulted that the breeder is sticking his nose into their business, when they should be happy that the breeder is trying to make sure they'll be happy with a puppy they take home. Some people get offended that a particular breeder turns them down. Lack of adequate time/attention or space for that particular breed, or from those particular parents, is often the case when people choose a breed for its looks that will not be suitable for their lifestyle. Should people rescue? YES! If they don't mind having a little unpredictability, or can accomodate a dog that may (or may not) need a lot of training or medical care, then absolutely. As the article mentions, dogs with few problems are adopted quickly, so they're out there in the shelters. Many people need the predictability of a RESPONSIBLY bred dog, however, and this article very eloquently states what ethical breeders do for a person looking for a purebred puppy. "Should people rescue? YES! If they don't mind having a little unpredictability, or can accomodate a dog that may (or may not) need a lot of training or medical care, then absolutely." Any dog, no matter how well bred, no matter how well you know its genetic history, has the possibility of having some unpredictability (they are animals, after all) & will need varying levels of training & medical care. Breeding dogs for a specific working purpose is smart, & if you need a dog for a specific working purpose, buying it from a responsible breeder is smart. But the vast majority of dog owners in America want a family pet, and in my experience, for that purpose, shelter dogs are generally on par with responsibly bred dogs in terms of cost, medical & training needs, behavioral issues, and time required. If you factor in the HUGE numbers of irresponsibly bred dogs, one could easily make the argument that for family pets, shelter dogs are a better bet. Responsibly bred dogs are not on par with shelter dogs in health and temperament. Dogs in shelters come almost exclusively from bad breeders, or are randomly bred at best. Nothing is 100% certain, but stacking the deck in your favor can't hurt! There is a reason Golden Retrievers and Labs are often the dog of choice for service dogs. They are obedient, intelligent, well mannered, playful and socially good with kids. The breeding and innate characteristics of breeds for assistance work need a solid temperament and should not be protective, or overly energetic. They need to be confident without dominance, and you don’t want them shy. The needs of the person for the dog also determines the size of the dog needed. Smaller dogs may have a harder time picking things up and reaching the disabled person and larger breeds can be harder to put out of the way of foot traffic, under tables and on public transportation. A dog that has any aggression to other dogs, is shy or growls, will NOT be a good candidate for assisting an individual no matter how much training they have and this is why the breed characteristics really do matter. A good breeder that home raises from birth is very important so training begins in early handling and socialization. Next there is basic obedience, good citizens testing is another good certificate created by the American Kennel Club and then task training specific to the person’s needs. Disruptions in the process to a dog that does not have the right characteristics, happens easier to a breed that is more skittish naturally, more vocal, etc. They must undergo rigorous testing of the things they might encounter out in the world doing things and going places pet dogs would not go. Paying attention to their historical tendencies in their breeding, bloodlines and how they were used for work, hunting, herding etc., is also a good gauge. This is not to say there are not great unexpected breeds that have exceeded expectations and saved lives through their service, or countless cases of Labs and Goldens that could not pass the tests. So do your due diligence because the promise of a happy working life lies in the effort.